A program where teams of students work together to solve original, fun problems. How do they present their solutions? What are the problems like? There are a variety of Long Term Problems and there are Spontaneous Problems. Teams take weeks or months solving Long Term problems. Spontaneous problems are given to the teams at the tournament. What is a Long Term Problem? Long Term Problems have many components and range from emphasizing technology (Problems 1 and 2) to emphasizing the arts (Problems 3 & 5). Problem 4 is always a unique balsa structure that holds weight. Judges are professionals, educators, artists, retirees, or military personnel from the Community. They are also volunteers from the team families who come for team credit. Team judges are not allowed to judge the same long term problem as the team. Parents who have children on multiple teams cannot judge any problem that they have a child in. Note: Ask the Regional Director about credits provided for Educators (TAGT) or other Professionals. Tell me about your costume. What happens at Judges Training? Judges receive general training on the program and the concept of creative problem-solving, and the judge types. Then they break out and learn about a specific problem in order to become competition judges. Check the calendar for location and dates of Judge Training in your Region. Judge Training is required every year for all Judge positions, even for returning Judges. After Judge Training, Judges are assigned different roles so that they focus on one specific part of the presentation. This makes it easier to understanding and give a score on a small element. No one judge scores the entire solution. Each scoring judge is paired with 2-3 other judges for the same elements and their scores are averaged. Greet & relax teams. Check paperwork. Give teams the chance to fix anything that is wrong or missing. Introduce yourself to the teams. Take paperwork to the judges and announce the team to the audience. Know what to score. Congratulate the team after its performance. Make sure the scores are in range and are compiled correctly. Manage the judging team. Meet with the coach and give the scores. Judges gather under the direction of their Problem Captain ("PC") and review several teams in one division, following a specific schedule. Judges remain all day in one specific area that they were trained for (Specific problem, Spontaneous, Scoring, etc.). 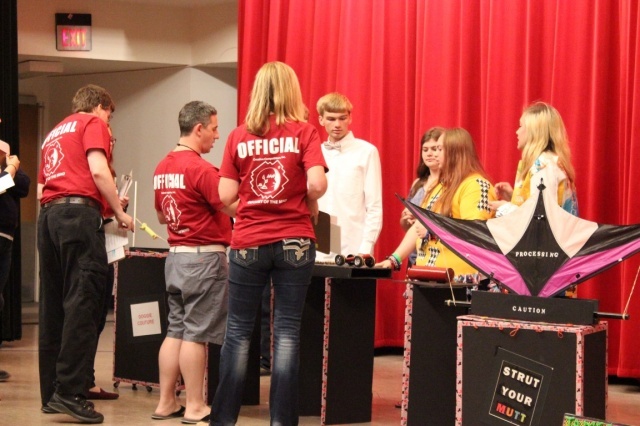 After Judges Training, Judges volunteer at the Regional tournament first. If the team they represent advances to the TX State tournament, then judges are asked to also volunteer at the TX State Tournament. In the Houston Region, ALL judges are required to participate in the TX State tournament as well. We need experienced judges for the second level. Judges do not normally travel to World Finals. A special contingent represents the TX team at World Finals. Judges who are interested to experience World Finals should contact their Problem Captain. Meals are provided for Judges and Officials. Please read tournament information provided about your local tournament. Reimbursement: Region Judges who travel at least 150 miles EACH WAY to attend a meeting or tournament can elect to be reimbursed at a rate of $.14 per mile (2018-19 rate). Hotel Accommodation is arranged and/or reimbursed for judges traveling to the State tournament from out of region. If you have any questions or need more information, contact the Judge coordinator or Regional Director for your region. "HARO" stands for Houston Area Region Odyssey. 2019 Problem synopsis (this will help you determine a preference before you register.) The full problem description and scoring sheets are provided at Judges Training. Check location and dates for Judges Training and Tournaments in your area . Ready to go to Judge Registration ?